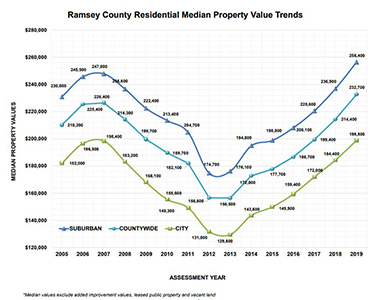 The 2019 Assessor’s Report details changes and trends in assessed property values in Ramsey County based on type and location. The annual report has been published and is now available online. Property owners can review this report to help provide a context for why their property values have changed over the past year. Property valuation notices and property tax statements were sent to property owners in March, which describe the changes specific to their property. Total growth in the 2019 assessed value of Ramsey County real property was $3.46 billion, with $2.76 billion of that growth coming from residential property. Property is at its highest value in Ramsey County history at $56.25 billion. As of the 2019 assessment, total estimated market value is now $6.51 billion above the pre-recession 2007 peak estimated market value. Median values of single family homes increased most significantly in the St. Paul neighborhoods of Dayton’s Bluff, Thomas-Dale, and Payne-Phalen. In the suburbs, the most significant value increases were in the cities of North Saint Paul, Maplewood and Mounds View. Posted on Friday, March 22, 2019 - 1:57 p.m.